In mice, cerebellar development requires PTPMT1, an enzyme that regulates the flow of fuel into mitochondria. The green color is calbindin, a neuronal marker expressed in the cerebellum. In humans, the cerebellum grows more than the rest of the brain in the first year of life and its development is not complete until around 8 years of age. The results were published Wednesday in Science Advances. “This finding will be tremendously helpful in understanding the molecular mechanisms underlying developmental disorders, degenerative diseases, and even cancer in the cerebellum,” says lead author Cheng-Kui Qu, MD, PhD, professor of pediatrics at Emory University School of Medicine, Winship Cancer Institute and Aflac Cancer and Blood Disorders Center, Children's Healthcare of Atlanta. Cells can get energy by breaking down sugar efficiently, through mitochondria, or more wastefully in a process called glycolysis. Deleting PTPMT1 provides insight into which cells are more sensitive to problems with mitochondrial metabolism. A variety of mitochondrial diseases affect different parts of the body, but the brain is especially greedy for sugar; it never really shuts off metabolically. When someone is at rest, the brain uses a quarter of the body’s blood sugar, despite taking up just 2 percent of body weight in an adult. The researchers created mice that have the gene for PTPMT1 deleted in neural cells, excluding non-neuronal cells in the brain as well as the rest of the body. 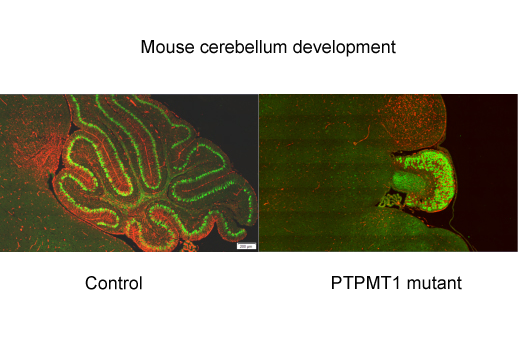 They created other mice with the PTPMT1 gene deleted in adult brains only, or in specific parts of the cerebellum. Qu’s team was surprised to find that pyruvate is critical for neural precursor/stem cells, even though they are not dividing quickly and it was the defects in these cells that caused complete block in cerebellar development in PTPMT1-deleted mice In contrast, rapidly proliferating granule cells, a distinctively small type of cell found in the cerebellum, are not affected as much by the deletion. Granule cells account for more than 80 percent of the entire brain’s cells, even though the cerebellum is a small part of the brain by volume. The distinction “represents a paradigm shift in our understanding of the metabolic regulation of various cell types in the developing cerebellum,” Qu says. It appears that neural precursor/stem cells rely more on efficient mitochondrial metabolism of glucose than progenitors and mature cells, he says. The first author of the Science Advances paper was postdoctoral fellow Hong Zheng, PhD. Emory/Winship Cancer Institute co-authors include Sumin Kang, PhD, Dolores Hambardzumyan, PhD, Anna Kenney, PhD, and Jing Chen, PhD. The research was supported by the National Institutes of Diabetes and Digestive and Kidney Diseases (DK092722) and the National Heart Lung and Blood Institute (HL130995).